2014-15 Panini Preferred Basketball ($185 per box) arrived Wednesday at Sports Cards Plus, a.k.a. The Super Hit Factory and it didn't take long to uncover some AMAZING HUGE HITS. Leland led the way with a Jabarri Parker Autographed Silhouette Jumbo Jersey RC and an Andrew Wiggins Auto Green Emerald RC 5/5. Florida Will came in for a couple of boxes. His favorite hits included this Kevin Durant 2014-15 Preferred Basketball Autographed Silhouette Jumbo Jersey Patch #d/25 and Kobe Bryant Multi-Patch Booklet #d/25. Tommy came in earlier in the week to pick his box from The BEST CASES in The Hobby at The LOWEST Price in The Galaxy (all of Texas). First he tried a box of 2012-13 Panini Gold Standard Basketball for ONLY $116.95 at The Super Hit Factory. Of course, our case provided Tommy one of the HUGEST HITS from 2012-13 Gold Standard, a redemption for a Damian Lillard 14KT Solid Gold RC 1/1. But Tommy wasn't done just yet. Tommy knows the Super Hit Factory is FULL of Super Hits. Tommy was about to take his Super Hits and go home. He took one more look around the store. He just had to have one more Super Hit but he couldn't decide what to try. I told Tommy, "I wouldn't give up on that case of 2012-13 Gold Standard Basketball; the Kyrie Irving Auto Jersey Patch RC is still in there." Tommy is a regular customer and knows, The BEST CASES in The Hobby are at Sports Cards Plus, so he gave that case another try. As predicted, here is Tommy with his Kyrie Irving Autographed Jersey Patch RC #d/99. Be like Tommy. 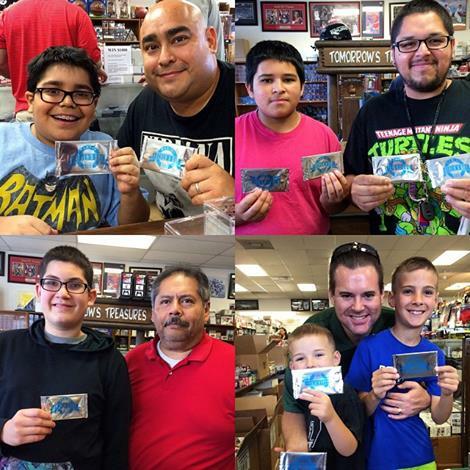 Go to Sports Cards Plus TODAY and get your fair share of Super Hits. Houston Tommy has been our customer for about 15 years. Tommy makes the drive from Houston to Sports Cards Plus to pick his boxes from The BEST CASES in The Hobby. Here is Tommy with his 2014 Topps Supreme Teddy Bridgewater Auto RC #d/99 and a 2014 Crown Royale Peyton Manning Autographed Gold Silhouette Jersey Patch card 1/5. That's right....... Only 5 made and Tommy got number 1 !!! 1. You can pick your box from The BEST CASES in The Hobby at The LOWEST Price in The Galaxy. 2. FREE Father's Day Pack with your purchase of ANY Panini Box ($50 or more) from 2014 or older. 3. Your purchase gets you a FREE Entry to our June 30th $500.00 Drawing! 4. Free Top Loaders for your autographs and relic cards when you open your purchases in our store.